March 22nd saw the 150th Riddlesdown parkrun, and it seemed a good reason to get the family involved in my usual Saturday morning fun. My daughter, Cat, introduced me to parkruns at the end of 2012 and I have been addicted ever since. We had previously never run a parkrun together so it was great that she came over for this. To allow me to keep up with a 3.18 marathon runner, Cat ran 16 miles to the start from Putney! 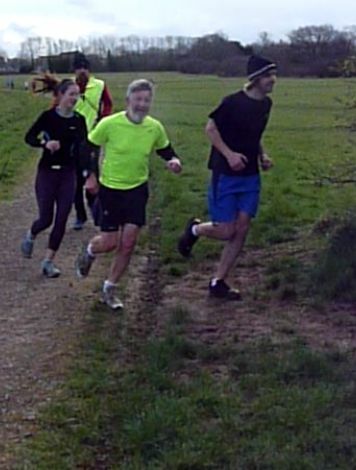 One of my son’s, Edd, joined us for his first ever parkrun. Not to be outdone by Cat, he cycled the 25 miles from Ealing, just a short training ride for his London to Paris 24 hour ride in July. He showed his school cross country pedigree by streaking away from us after 4k. 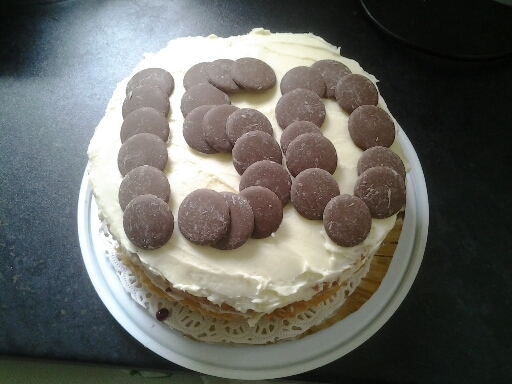 Because this was a special event, I decided it was time to practice my cake making skills, and with a deal of success! Support and photographic services were provide by my other son, Andrew, and my wife Marion, and my next challenge must be to get at least one of them to run/walk the Riddlesdown 3rd year anniversary event in mid July. What makes a good overseas marathon? Location, organisation and route immediately come to mind and Paphos certainly fills these requirements. 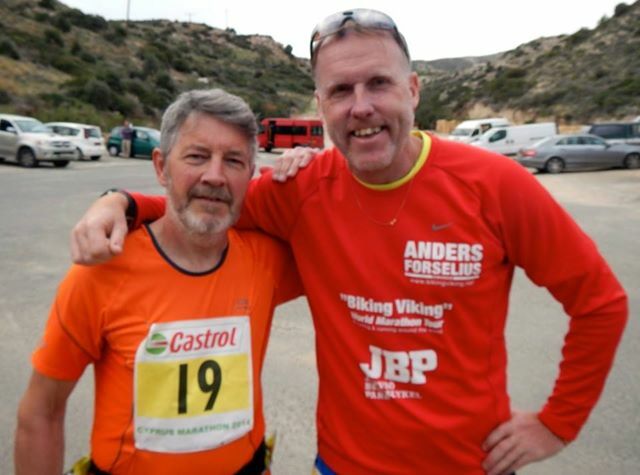 You are bused to a spectacular 7.30 start at Aphrodite’s Rock (with a pre-race group photo) and finish outside the fort on Paphos Harbour, although much of the route is through uninhabited areas, so support is minimum. There are water stations every 3k, with energy drinks also provided at every other station, and BEER at the finishing line. Because the entry is small (just 100 finishers) it was easy to meet and mingle with all the other runners and this race was packed with personalities. Husband and wife runners David and Melanie Ross were on my flight out; they are Hermes Running, both members of the 100 Club, each having completed more than 200 marathons. 26.2 miles are just the starting distance for them, ultra-marathons of 100 miles don’t phase them and David is in the Guinness Book of World Records for his speedy marathon running as book and cartoon characters. Danny Kay also ran the race, and won his age category (how many times has he done that?) Another extreme 100 Club member, Danny has more than 500 marathons to his name so it wasn’t surprising when he said he was staying over in Cyprus to run the Limassol marathon the weekend after Paphos. 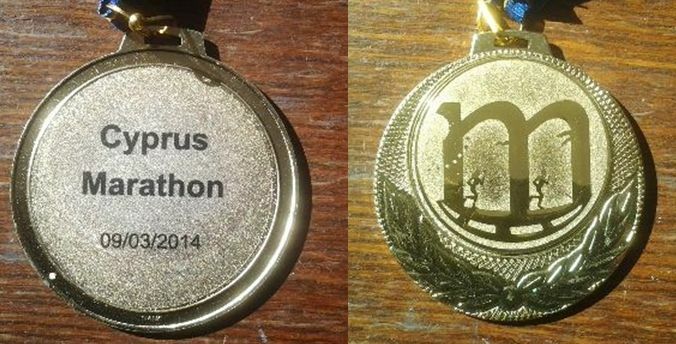 So, what makes this marathon different from other marathons? 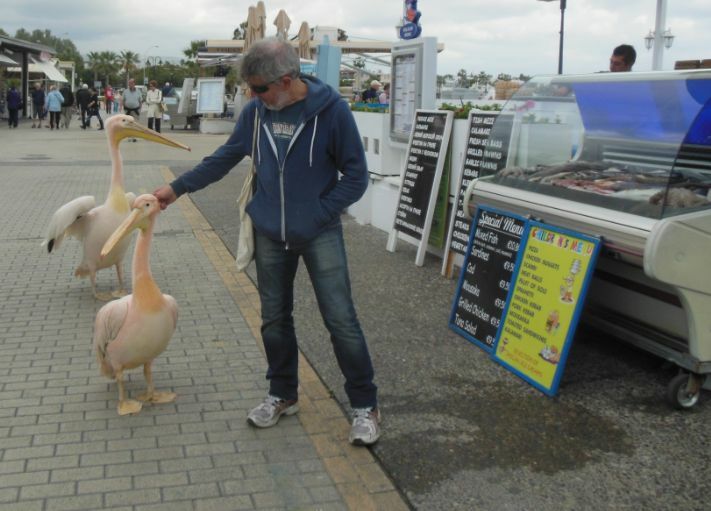 In the row of restaurants leading up the to fort is The two Pelicans. For once a name is accurate as every day two pelicans can be seen, photographed and stroked wandering around inside and outside the restaurant, and I believe they are not averse to pinching food off plates if customers are not alert. And so what about my third marathon? Best one yet, at 4:14:18 an 18 minute PB. Not quite good enough for an award in my 60-64 age category, but bizarrely if I had been 5 years younger I would have been second. There will be many more runners in my next marathon in Düsseldorf in a few weeks time.